Felz Blows Off the HJTA. Illegal Water Tax Ripoff Continues. Lawsuit Imminent. 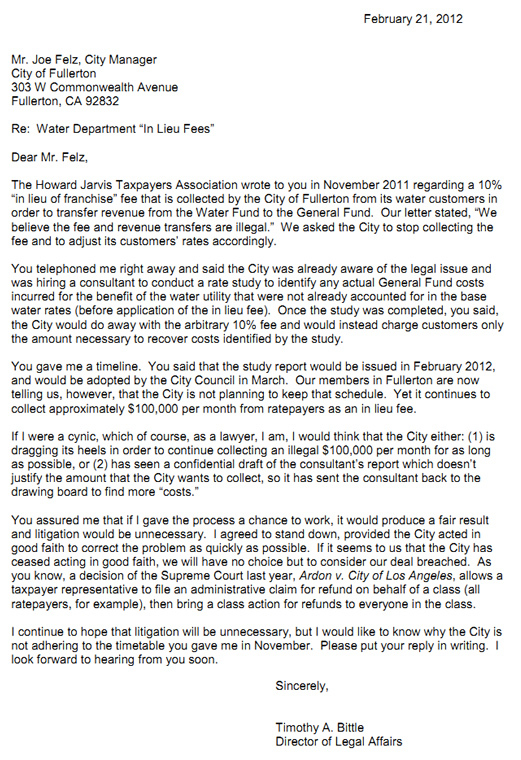 The Howard Jarvis Taxpayers Association fired off another pithy letter to city manager Joe Felz last week, accusing him of intentionally delaying the termination of the illegal 10% in-lieu water franchise tax while continuing to collect over $100,000 per month from Fullerton residents in violation of the state constitution. The letter states that Joe Felz verbally admitted to the illegality of the fee and promised action within a certain timeframe. But honesty is not a virtue within city hall, and nine months later Felz and his trusted council majority of Bankhead, Jones and McKinley still allow the city to continue its theft without comment or remorse. Mr. Bittle closed out his letter with a threat of a class action lawsuit that would seek a refund on behalf of all Fullerton water users. As one of the 135,000 ripped-off residents, I’d say that’s a great idea. An emergency parent meeting was called at Beechwood school last night to explain that a teacher had been placed on administrative leave and that the police department was conducting an investigation into…well, something they’re not allowed to tell us about. The Chief was adamant that there was no evidence that a crime was committed or that any students were involved, which makes you wonder what he’s “investigating” in the first place. It’s interesting to watch Superintendent Hovey and interim Police Chief Hughes struggle with a new-found interest in transparency, releasing only enough information to scare people about what the teacher might have done. Parents in the room didn’t seem to appreciate the lack of detail. One mother even came to tears trying to figure out if anything had happened to her own child (25 minutes in). I do not mind being held accountable. For clarity’s sake, I have NOT been briefed on any aspect of this story beyond the information which has been made publicly available in the meeting posted here. 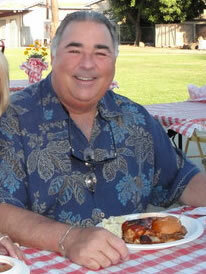 I have made it clear to Dr. Hovey that I believe that fact is inhibiting my ability to do my job as a trustee. Dr. Hovey informed me that he had been advised by the district’s law firm as to what information he could and could not give to the board members. He did confirm that he knows more than we do. As the law firm’s primary role is to limit the districts liability, there is no surprise there. Unfortunately, my role is to be 1/5th of an independently elected body whose job it is to ensure that our district does the right and smart thing, and I cannot very well do that if I am “managed” by the district’s lawyer. I believe that the theory is that if the board members are informed of the details of the investigation prior to the conclusion of the investigation that our impartiality will be brought into question if any decisions need to be made by the board as a result of the investigation. I don’t buy it. The people elected us to oversee this government entity and the entity itself is preventing us from knowing the details of what is going on within our own walls. At the risk of sounding self-important, I thought we were in charge. Having said that, I would not personally use the phrase cover-up at this point. I will not quietly sit by uninformed for any extended length of time. This situation is three days old and we are talking about an elementary school. The individual who is the focus of whatever it is we are investigating has been administratively removed from the classroom and we are being told that there is zero evidence of any direct impact to children. My first step is really what I am doing here. Making it known publicly that I think it is a mistake to withhold the details of the investigation from the board. Ostensibly, the board would be able to offer some comfort to the community…or some guidance to management about we believe we should proceed. I have no idea if I even agree that there should be an investigation. As a final comment, I want make it clear that I believe it is exceedingly likely that both Mitch Hovey and Dan Hughes are doing what they believe to be best for the children and the community. I also believe that it is my job to review all of the knowable circumstances in order to determine whether I concur with Dr. Hovey’s actions. I have no way of doing that now. What is a Brady Cop? And What Did Vince Mater Do to Become One? Update: When you’re trying to pierce the veil of secrecy in a police department bent on concealing its officers’ misdeeds, some of the details come through a little fuzzy. I recently received some corrected information on officer Mater’s role in the arrest, highlighted in red below. Note that Mater is still the officer who (allegedly) destroyed his audio recording and was later fired. A Brady Officer is a cop with a sustained record for knowingly lying in an official capacity. 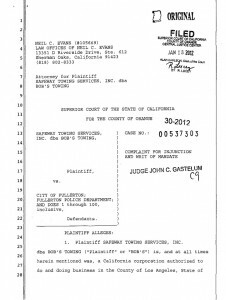 A Brady cop’s testimony in court is almost worthless, which makes you wonder why a police department such as Fullerton would bother to employ one. But on to the story. 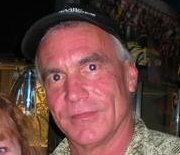 Remember that odd Fullerton jail suicide of Dean Francis Gochenour last year? The word was that the jail arresting officer by the name of Vince Mater had broken apart his audio recorder and smashed the chip containing a recording in the immediate aftermath of the suicide. Whatever was captured on that recording before and during the arrestee’s suicide, we’ll never know. A few months later, Officer Mater was quietly fired. We don’t know how Officer Mater earned his status as certified liar, but if it was so bad that even the FPD couldn’t look the other way, well…it must have been pretty bad. Mater’s name did appear in an OC Register story in November 2010 about the wrongful incarceration of Emanuel Martinez at the hands of the FPD, in which Mater was johnny-on-the-spot with a gang tag that helped send the wrong guy to jail. Fast forward to 2011, when the FPD ends up with a dead guy in jail, a smashed recorder, another cop on paid leave and presumably another set of lawsuits. Oh, and one more thing: for all the City’s talk of transparency and its employment of several highly-compensated Public Information Officers, all of this information was kept from the public until…well, today. In case you missed it, here is Chris Thompson discussing some Fullerton recall details on the John and Ken Show a few days ago. Naturally the discussion gravitates towards the tens of thousands of dollars that the police unions have kicked in against the recall to protect their three depreciating investments. A few weeks ago we told you all about the Fullerton Police Department’s attempt to protect the city’s tow monopoly through harassment of AAA tow truck drivers. Now the OC Weekly is reporting that a suit has been filed against the FPD claiming that police officers harassed and intimidated tow truck drivers for competing against the city’s preferred tow vendor. The suit alleges that drivers from a Bob’s Towing were singled out and cited over 40 times for frivolous reasons while other companies’ drivers went untouched. Officers Hagen and Ledbetter are accused of turning off their audio recorders for “off the record” conversations constituting harassment. Drivers have quit and left the city in fear. Is the FPD violating these folks’ constitutional right to equal treatment under the law? That seems to be par for the course. Of course, if the PD has been systematically denying it’s own citizens the benefits of fair competition, then this has undoubtedly caused drivers to be left stranded while AAA scrambles to find tow truck drivers willing to face the FPD. And then there’s that big question we keep having to ask: Can a single month go by without the FPD drawing taxpayers into a major lawsuit? Here’s a republication of a post from early November. It details the extravagant pension payouts bestowed upon Fullerton employees. Of particular note are the number of rank and file cops and firemen on the list. How did they get there? Courtesy of enormous salaries and of course the disastrous [email protected] formula approved by Council barnacles Bankhead and Jones. That single decision created a massive unfunded actuarial liability that is the legal responsibility of every citizen of Fullerton. And there’s Pat McPension, the architect of the FPD Culture of Corruption, who makes $121K off of us each year for doing nothing. Another year has passed and another set of City of Fullerton retirees have added to the growing unfunded pension liability that will plague us for generations. In fact, membership has swelled by a startling 41% this year alone. The most notable new member is retired City Manager Chris Meyer, who has plopped himself in the second spot with a $170,984.52 per year reward for all the time he spent carefully overlooking the mismanagement of the Fullerton PD and the vast expansion of the city’s pension debt. Meyer was spotted at yesterday’s anti-recall fundraiser, too. That’s no surprise to us, since Bankhead and Jones did attempt a retroactive pension spike in 2008 that would have sent Meyer’s own pension into orbit just a few years before his exit. 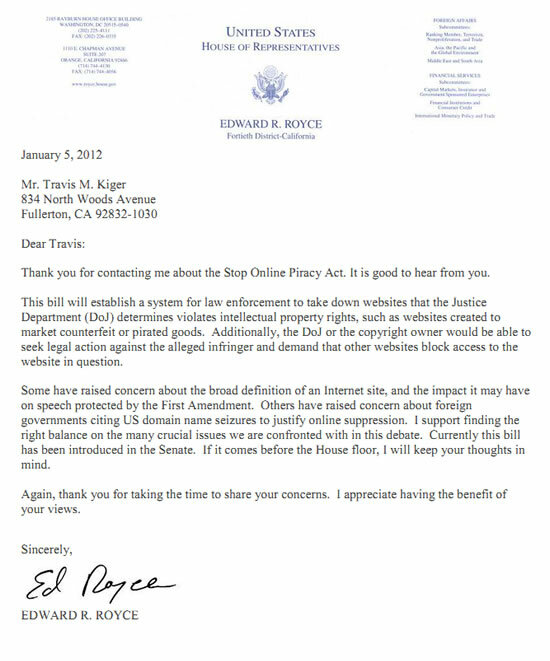 What Does Ed Royce Say About SOPA? You may have noticed that sites like Wikipedia and Craigslist have gone offline today to protest a pair of bills that threaten free speech on the Internet by criminalizing the simple act of freely linking to other websites. If the SOPA and PIPA bills were to pass, even your comments here on FFFF would be affected. This blog would carry the legal burden of preemptively censoring links posted by our visitors or risk criminal penalties. The resulting chilling effect would be a catastrophic blow to public discourse and our freedom of speech on this blog. Back in September, a AAA tow truck driver made a YouTube video accusing Fullerton police officers of running a coordinated effort to harass and cite any tow truck attempting to help stranded AAA members within city limits. That video was removed shortly after it was posted. According to the original publisher, it was deleted from YouTube after the truck driver’s boss received threats from city employees. Four months later, it appears that driver has had enough. Here’s a new video where he accuses the City of Fullerton and its police force of using Fullerton’s new truck route ordinance to cite AAA tow trucks attempting to respond to customer calls for service. 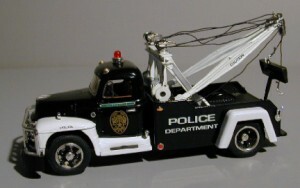 The assumption is that there are a few tow operators who operate with the FPDs’s blessing (thanks to generous donations towards a few jurassic city council members’ campaign funds and a revenue sharing contract with the FPD) and thus are able to miraculously avoid getting cited for driving their tow trucks on the very same roads. So next time your wife or daughter is stranded by the side of the road for an hour waiting for one of the few AAA operators left willing to run the FPD gauntlet, make sure you ask the driver what it’s like trying to help motorists in the city of Fullerton. Welcome to Fullerton! You're on your own. Fullerton ain’t the only city in this world that needs a deep cleanse, but we like to think of this blog as a model to decent people all across this country who wish to start defending their own cities from the corrupt, the callous and the hopelessly inept types who’ve promoted themselves to positions of power at our expense. Well, it looks like other people share that vision, too. Here’s a letter that came to us today all the way from Atlanta, GA. I would have never thought or believed the amount of corruption at the city level. I found your website because of Kelly Thomas. I check your blog daily for updates on these police officers hoping they will serve justice one day but I found reading the rest of your blog to be very saddening about what goes on behind close doors. The amount of corruption goes from the top to the bottom and seems endless. I am amazed at how well you guys stay informed on the goings on. You guys do inspire people but I am curious as to how you guys stay on top of everything. I know you attend town hall meetings and such. I am gathering friends and taking an active roll in our community so things can look brighter for our future and our kids future. I just want to say thank you. Also, I just viewed this video and wanted to share. It gives an inside view of a police officer who was with the New Orleans PD. Thanks for the letter, Jeff and thank you for sharing the example of a real cop upholding his oath and breaking the code of silence. The California Supreme Court finally saw municipal power grabs of private property and tax dollars as illegal and made cities’ redevelopment agencies history. But for those who wax nostalgic for the good old days of Fullerton’s redevelopment agency, they may warm their hearts and hands at the redevelopment agency’s legacy to us, “Heritage Walk”, an “affordable” housing development located near Richman Park in Fullerton. In 2010 the Fullerton Redevelopment Agency agreed to pay the private developer, the Olson Company, to build thirty-four houses so persons with moderate to low incomes could afford to buy these houses. This development is called “Heritage Walk”. Now, The Kennedy Commission, named after Ralph Kennedy, the father of Orange County Human Relations Commission CEO Rusty Kennedy, defines moderate to low-income as less than eighty percent of Orange County’s median income. Orange County’s median income in 2009 was approximately $71,000 a year. Only families earning less than $56,000 a year would qualify to buy Heritage Walk houses. However, Heritage Walk housing development allows persons with annual incomes greater than a $100,000 to buy their low-income affordable houses. The Kennedy Commission asserts affordable housing for low to moderate income earners is essential because most of these low-income earners can’t afford to pay the average Orange County $1,594 a month rent for housing. Heritage Walk says its potential buyers may be expected to pay from $2,762 to $2,984 a month for the privilege of living in “affordable” housing built with our tax dollars. Who will miss the use of tax dollars to fund private construction of affordable housing? Those who earn between $72,000 to $111,000 a year or those who will no longer be allowed to use public monies for private construction ventures? But this is conjecture to be pondered by the good people of Fullerton.